ZOLTAN ALDOTT, MOL executive vice president for exploration and production, one of the company's most capable managers, has been at the head of INA's board of directors since April of this yearThe growing number of calls for a possible revision of the key contracts outlining relations between Croatian Government and Hungarian-based MOL will have an effect on the operations of Croatian oil company INA. Zoltan Aldott, a 42-year-old Hungarian expert and the MOL executive vice president for exploration and production, has been at the helm of INA's management since April of this year. For year now Aldott has been considered one of the Hungarian company's most capable managers, one who has taken part in a number of the company's key projects over the past decade. 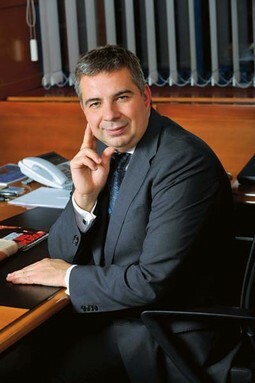 The appointment of Aldott to the head of INA's board of directors has been interpreted by experts in the field as an indicator of MOL's desire to improve the Croatian company's operations, and these forecasts have proven accurate, as INA's financial situation has been stabilised in a short period of time and a number of important internal processes have been launched in the company. But, if reports of Croatian Government's alleged wish to put the division of management rights in INA and of the natural gas operations under review prove to be accurate, Aldott will be faced with a new and serious challenge. He will have to secure the further growth of operations and work on improving the company's public image, somewhat shaken by speculation concerning the legality of the second phase of the INA privatisation process, in the midst of turbulent negotiations between the two major co-owners. NACIONAL: What will INA do if Croatian Government does not purchase the natural gas operation by the end of the year as contracted? Is a review of the contract a real possibility? - That really is a question the two major stockholders will have to discuss. INA's position is clear - as long as the natural gas business is a part of INA, which we can run on market principles and with the know-how we possess, INA is qualified for the job and will bear the responsibility for it, including the supply of all households and industrial consumers with whom we have valid contracts, and the purchase of sufficient quantities of natural gas to cover these requirements. But if we have to "help out" some buyers by offering them natural gas under market prices, we are taking money away from new investment. And INA's profits are also the profits of Croatian taxpayers. NACIONAL: Last week Croatian Government announced three future members of the INA supervisory board who do not originate in party political arena, but are rather experts in the natural gas and oil industry. Will this lead to significant changes in INA operations? - As early as last year the INA management introduced several changes that have oriented INA towards positive development, which is already evident and will be reinforced further. The proposed members of the supervisory board will be able to support these developments jut as the current Croatian members have done in close collaboration with the other members of the supervisory board delegated by MOL. I would say that we have had and continue to have good cooperation and support from the Croatian Government delegates in the supervisory board since MOL took a stake in the company. In the specific case of INA, the chief decisions on running the company are made by the board of directors, while some chief strategic and business decisions are made by the supervisory board, some by a simple, and some by a qualified majority. NACIONAL: Davor Stern, a future member of the supervisory board, has said he will focus on finding out what the core of the conflict between the two owners is and to try and see where the differences of opinion are? - As far as cooperation with Government is concerned, I can say that it has always been pursued with mutual respect and understanding these past seven years, with the common goal of once again making INA a strong and respected firm. I cannot imagine any other scenario than that both stockholders are interested in turning INA into a profitable company that can facilitate the development of the country. The only key area in which their interests have not been complementary are the future operations of the natural gas business. As I have already noted, Government's stated strategic interest was to maintain and increase control of natural gas supply in Croatia. A solution was hammered out beneficial to both sides that guaranteed the development of the company and, at the same time, meant retaining the security of supply for all Croatian citizens and companies. We are still working with these same goals in mind, and should always do so, even if possible changes in market conditions or in the intentions of stockholders require of us that we rework the agreed upon framework. That is only possible, however, by mutual agreement. NACIONAL: Last week it was announced that the INA board had decided to implement some changes to the board of executive directors reducing their number from seven to six, which would be a relative rise in the share of Croatian members. What is the reason for this change? - On the one hand we have implemented a rationalisation of sorts within the company that serves our continued focus on efficiency while, on the other hand, these changes reflect the increased focus on modernisation and the revitalisation of the retail network. Over the past decade INA has not invested enough into its retail network for a number of reasons, right and wrong. That, however, is no longer sustainable. We need to undertake a drastic renewal of our network and improve both the level and quality of service provided. Over the coming years, starting with this December, we will be targeting significant funds to our petrol filling stations with the aim of securing better service. 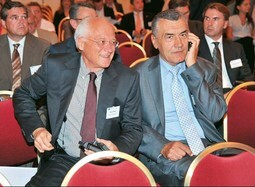 NEW MEMBER OF THE SUPERVISORY BOARD Davor Stern (in the photo with Ivica Mudrinic), an oil consultant and the former CEO of INA, will replace Finance Minister Ivan Suker on the supervisory boardNACIONAL: How do you interpret the fact that a report on fines levied for Hungarian managers working at INA without work permits were made public last week, twenty days after INA had paid the fine and the entire matter had been concluded? Do you see it as a kind of pressure exerted on the company by Government in the context of the situation with the natural gas business and the possible review of the contract? - We made an administrative error, one we have admitted and for which we have paid the fine. It was an unfortunate error that could have been avoided. It was based on the evidently incorrect advice MOL received from PriceWaterhouseCoopers. We have undertaken actions to make sure that it does not happen again and we have adjusted the procedure. On the other hand, foreign workers would probably agree that the country could in the future have a simpler procedure, friendlier to investors. When we recently deployed two Croatian experts to oversee a drilling operation in Hungary, for example, they were issued work permits within 48 hours. NACIONAL: In your testimony before the parliamentary inquiry into the privatisation of INA you said that INA was a "joint venture between two strategic partners, and if there is no agreement between them, the enterprise was going nowhere," but many people feel that the agreement is unfavourable to the Croatian side. - It is in the interest of both major stockholders to once again develop INA into the leading oil and natural gas company in this part of Europe. But to achieve this goal we need a solid cooperation among all of the management bodies in INA to have effective decision-making, which has been ensured by the stockholders' agreement and other management documents that secure both sides the relevant rights. It needs to be understood that Government does in fact hold a somewhat smaller share of INA than MOL does, and as such requires MOL's support in votes to select any representative to INA management bodies. This support has been guaranteed by the stockholders' agreement. Secondly, the representatives of Government can jointly block any strategic decision by INA at the supervisory board, although they have not yet availed themselves of this right. And again, this right is guaranteed only by the stockholders' agreement. Thirdly, MOL has undertaken the obligation to not sell INA stock over the coming five years, and Government has preemptive purchase rights in the event of a later sale of INA stock on the part of MOL. Government would not have any of these rights without the stockholders' agreement. When INA recently faced serious challenges concerning its further investments into its future, even in the midst of economic and financial crisis, when most companies significantly reduced their investments, it took advantage of the financial strength of the MOL Group. It was this alone that allowed INA to stabilise its operations and hold on to its market position. NACIONAL: You said that the two chief stockholders had to work well together when making decisions if they are to achieve the best possible results. How is your cooperation with Croatian Government? - We always try to find solutions acceptable to both stockholders for all of the key decisions we make. On the on hand, INA needs to share a common position with Croatian Government and to be its proactive partner in order to, through our leading role in contributing to and promoting the interests of Croatian national energy policy, boost the country's economic strength. On the other hand, INA also has to achieve the best possible bottom line so that it can continually invest into our future, contribute to the national economy by paying taxes, and in paying dividends to its stockholders in the future. To be entirely frank, the current situation has to move a step forward. Instead of denial and rejection, we need solutions and compromise. We definitely need to create a clear concept, especially in regard to the obligations that arise from the master contract on natural gas operations. NACIONAL: It has been said that MOL has a majority when adopting decisions and that it can, as a result, independently decide on financial and operational plans, while Croatia, with 44 percent of the stock, three percent less than MOL, has no influence on these decisions? It has also been said that all decisions on investment into INA exploration and production are adopted only after approval by the MOL board of executive directors? 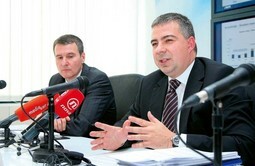 - We cooperate with Government and there are no independent MOL decisions. We have an equal number of members on the six-member board, three Croatian representatives and three Hungarian representatives of MOL. Even if there are at times certain differences of opinion, we always try to find an optimal solution that will best suit the interests of both stockholders. That is why all key business decisions are adopted and approved jointly. This also pertains to decision on investments into exploration and production. As far as the business itself is concerned, it is in our common interest that, together with Government, we facilitate the growth of INA's exploration and production, a key activity for integrated oil companies like INA. Prior to my arrival there were proposals to sell a part of our exploration and production in Syria to Petrofac, the chief contractor for the local natural gas plant. We said that we could make cuts on many things, but that we cannot threaten our business interests in exploration and production in Syria or the Croatian Adriatic. INA's SD exploration and production has an enormous wealth of experience, even in light of the fact that the current major projects were launched a decade ago and that a lack of funds has meant that there has been no real development in the sense of a broadening of activities to new markets. We now have to intensify our presence in Croatia, in the wider region, and in places INA has known traditionally. As a member of the MOL Group, INA will benefit from the fact that MOL has over the pat five years systematically expanded its activities in exploration and production around the world. INA can join some projects, participate in new ones and launch its ideas where it can use the financial and human resources of the Group to complement its own strong capabilities. NACIONAL: Among experts the opinion is that INA has in general been much more effectively managed since the new stockholders' agreement came into force, but there are also those who say that INA is no longer being developed as an independent company, but rather in line with the corporate strategy and interests of MOL. - Both INA and MOL are members of a large international corporation, the MOL Group. Within this frame the future development and INA's potential are very important to MOL, because INA's results largely affect the success of the group as a whole. We cannot allow ourselves to make decisions independent of one another on new exploratory drilling just a few kilometres from one another across the border if drilling one hole will produce the same result, and we should not be competing against one another in for exploration concessions in the same country in order not to assist the competition, and we should not be offering the same oil product to the same buyer, for example in Slovenia, in order not to undermine our own position in competition. Quite the opposite in fact - in order to avoid these and similar situations, a regular procedure for consultation and information exchange has been established between the companies, which does not mean that MOL can decide on its own on these issues. For my fellow managers and myself here it would be a simple task if all decisions were made at MOL, but we have not experienced this. But, to ensure efficiency, MOL has undertaken the responsibility of running INA operations so that it serves the interests of all stockholders and has made significant investment into INA to improve the company's activities. That requires a control of the processes in the company, and any responsible owner would do so to protect their investment. NACIONAL: In your testimony before the parliamentary inquiry you said that one of the reasons for the changes to the stockholders' agreement was that INA was in a very difficult situation in late 2008. The company lost 1.5 billion kuna in the fourth quarter of that year? - The financial situation the company faced in 2008 and the results at the time were not an isolated case. All companies in this sector saw a massive drop in the bottom line during that period and were under hard economic duress. Furthermore, when the financial crisis came, INA, on the basis of a joint decision by the two major stockholders, continued to invest in the refinery modernisation programme and in exploration and production in the Adriatic Sea and in Syria. This was done because a halt on these projects would have resulted in a major loss of value and in abandoning significant market share to the competition. As a result, when the banks slashed lines of credit in the wake of the financial crisis, the two major stockholders at INA had to finance growth that required much more capital than was generated by our current activities. After the consolidation of INA into the MOL Group, MOL became INA'S largest creditor, helping it reduce the large accumulation of mature tax obligations towards the national budget. Besides paying mature tax obligations that had reached over 2 billion kuna, INA paid over 200 million kuna in interest on late payments to the national budget - which is 0.2 percent of the total national budget for 2010. The company also took on new loans to finance its long-term projects. Because of legal constraints or as a result of political expectation the company had to sell its natural gas and derivatives under market prices for a number of years. In the sale of natural gas in particular this meant significant losses of several billion kuna over the past decade. It was the Government's choice and it is the only issue that has caused tension between the major stockholders since the privatisation in 2003. THE INA LEADERSHIP Zoltan Aldott with Bojan Milkovic, chief executive director of INA, at a press conference following a general stockholders meetingNACIONAL: In the analysis of the master contract on natural gas operations it is emphasised that the state has assumed only the unprofitable segments of the natural gas business, and provided INA future hyper-profits from the sale of domestic natural gas, and guaranteed purchases for a period of 15 years at price many times over the cost of production, and has besides paid some 500 million kuna for the Okoli storage facility, and another 700 million for the gas it contains. It turns out that the state has paid INA to cover its future losses. Is this an accurate analysis? - What is clear to industry experts can be hard for the layman to understand - the price of natural gas is defined by its value on the market, and not by the cost of production. From this position it is like bread or milk. You have to compete with other suppliers of natural gas, most of which are much larger companies like Gazprom, ENI and E.ON. Natural gas operations will not generate losses when market prices are attained, and it will in fact be Government that will influence the price for consumers. With the liberalisation of the market our natural gas trading company, Prirodni plin, will be in a position to make a profit. With the recognition of the real price of energy, infrastructure can develop, and the financial prerequisites will have been set for the stronger development of INA. What is more, it would also facilitate the energy efficiency and the rational use of energy that has taken place in other European countries. Government has a very strong ownership position and control in the natural gas value chain. It was Government's intention to ensure security of supply through the control of the Prirodni plin company, to control natural gas operations, as it was considered a strategically important business, and to protect certain groups of consumers from sudden price spikes. Government has undertaken the obligation to buy domestic gas from INA over the coming fifteen years. This has also obliged INA to sell its gas to Government, even if it had better sale opportunities in Italy, Hungary or elsewhere. As a result solely of that fact that natural gas has been treated as an element of social welfare for the past decade, natural gas infrastructure in Croatia not developed sufficiently to meet the current demands of the market.